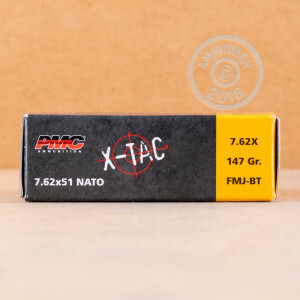 This mil-spec 7.62 NATO ammunition from PMC offers dependable performance for M-14s, FALs, AR-10s, and other 7.62/.308 Winchester rifles. 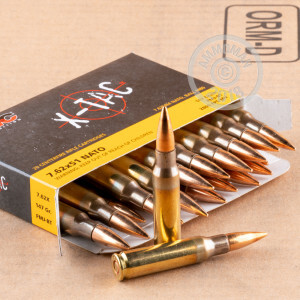 Each cartridge in this box of 20 is loaded to the M80 specification and fires a 147 grain full metal jacket bullet at 2,800 feet per second. Shooting mil-spec ammo gives you the convenience of using a variety of comparable loads without adjusting your optics. 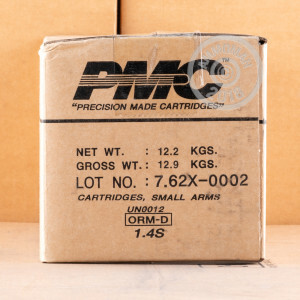 PMC ammo uses non-corrosive Boxer primers and brass cases. It is loaded in South Korea by Poongsan, a major defense contractor for the South Korean armed forces.